2003 - Professional arbitrator, table, chairs, two noticeboards, media advertising, members of the public. A small stall was set up in a marketplace, close to other market stalls and in sight of the facades of multinational businesses. At the stall, the services of a local professional ‘arbitrator’ was made available, without charge, to the public for the period of one day. 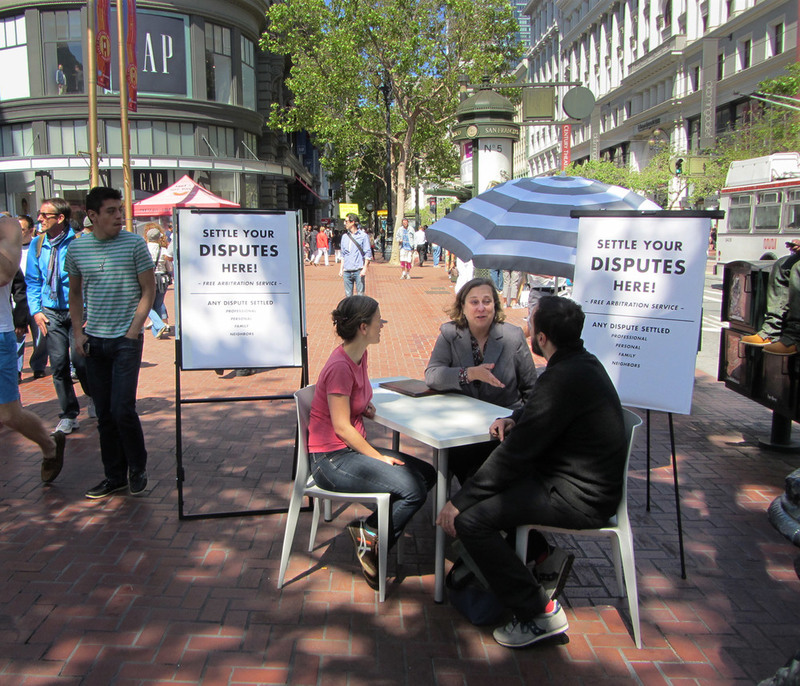 Arbitration is the process in which disputes are settled by the use of a professional mediator. Arbitrators are primarily used in commercial situations in which conventional discussion processes have broken down, but in which peace must be created. The process may be familiar to anyone who recalls the clashes between trade unions and their often-corporate employers in the days before the globalised erosion of union power. The arbitration service was on offer for the period of one day for two (or more) people who had a dispute – any dispute - to resolve. The arbitrator was situated at an office-style table, with two office-style chairs for members of the public to sit down. Prior to launch, the service was advertised in the local media and signs were also placed next to the stall. The piece also made reference to larger questions of conflict. Arbitration is inherently concerned with the attempt to create peace. Thus this tiny site, almost as small as a picnic table, alluded to notions of a peaceful Utopia, whilst it nevertheless seemed vulnerable, dwarfed by the size and architecture of the surrounding environment. The site offered a tiny and temporary peace zone that was gone all too soon.